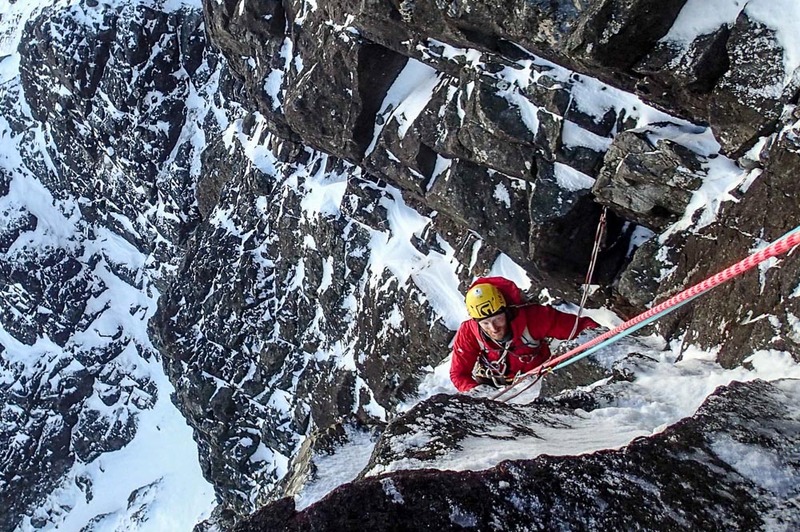 Masa Sakano and Tom Bishop had two excellent days climbing on Skye at the end of last week, which resulted in the ascent of an unclimbed gully in Coire Scamadal and a new Direct Start to the rarely climbed Franklands’s Gully on Sgurr Sgumain. which hosts many top quality ice and some mixed routes though they rarely come in condition. After four days of deep freeze (which followed three days of big thaw), we thought we might have a chance. No, we were wrong. Even Scamtastic wasn’t in a leadable state, Grade VI ice routes were definitely out, and the buttress was mostly black, despite eyeball-hammering blizzard in the morning. Instead we climbed the next major gully of Vertigo Gully, 100 metres or so to the right (facing in), and named it Tom’s Gully (III). Though there were plenty of icicles hanging here and there in the gully, the conditions were sub-optimum with loose rock and mostly soft turf except those covered with ice. Basically, turf looked too dry, which is not the word I often use to relate to Skye… If everything was frozen solid, it would be a decent and sustained Grade III snowy mixed route (a bit like Twisting Gully in Stob Coire nan Lochan), with four short vertical sections in two long pitches (roughly 90m in length). Freeze-thaw cycles are needed! The following day (February 2), we aimed higher to North Buttress of Sgurr Sgumain, wading powdery snow, and did Frankland’s Gully with a new Direct Start, roughly following the P1 (5a) of the summer route Grannie Clark’s Wynd. I was mightily impressed with the quality of the pitch! 45m of very sustained mixed climbing with two cruxes: an overhanging bulge in the first 15m cracked corner and the 10m-long flake-crack in the upper part. At one stage in the upper crux, I relied on a single side-point of a crampon on a tiny rounded 2mm-edge (though perhaps I just missed to spot an easier move). I guess the Grade is VI,6. This entry was posted in New Routes and tagged Coire Scamadal, Masa Sakano, Sgurr Sgumain, Tom Bishop. Bookmark the permalink.